In our second foray into the emergent science of nanotechnology and its potential applications to energy generation, we turn to the remarkable little device known as the 'Power Chip' being developed by Power Chips PLC, a subsidiary of Borealis Exploration Limited. The Power Chip is a solid state device that utilizes a heat source to directly create electricity and promises to operate at up to 70%-80% of Carnot Efficiency, the maximum efficiency of an ideal (and impossible) heat engine. This compares to gas turbines which typically operate at 30-40% of Carnot Efficiency or diesel or gasoline generators that operate at only 10-15% Carnot Efficiency. Needless to say, this is a remarkable claim. So how do they supposedly do it? The Power Chip utilizes the quantum phenomenon of electron thermotunneling to generate electricity. Electron tunneling is a well-known quantum phenomenon where electrons, particularly those of high kinetic energy, i.e. hotter electrons, will jump from one location to another across very small distances (typically from 1 to 10 nanometers). This effect has impeded the miniaturization of transistors for microchips as the transistors have become so small that electron tunneling disrupts their operation. However, Power Chip researchers have applied this phenomenon to energy generation and heat management. As mentioned before, electrons with high kinetic energy are more likely to tunnel. This gives rise to the potential for thermoelectronic devices wherein one side of a surface of a suitable material is heated, inducing electrons to tunnel across the surface towards the cold side creating a current. However, in such devices the heat tends to distribute itself across the material and eventually the tunneling effect begins to lose its uniform direction as elecrons begin to tunnel every-which-way and the efficiency of the device drastically decreases. The trick then is to create some kind of insulation layer to prevent the heat from distributing across the device but one small enough (and we are talking less than 10 nanometers) to allow the electrons to tunnel across it and thus keep the electrical current flowing. This is what Power Chips PLC's research staff has purportedly done. They use a vacuum gap as the insulator which is quite efficient - no heat can pass through the vacuum. The next trick, and this one is no trifle, is to manufacture a device of suitable size while still maintaining a uniform distance between the two electrodes (i.e. across the vacuum gap). 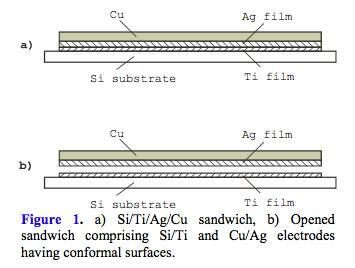 This gap must be uniform to within tens of Angstroms (10^-10 meters or .1 nm). This presents a sizable challenge as state of the art polishing techniques can only offer flatness of 0.5 microns per cm, still two orders of magnitude to large for this use. Power Chips PLC thus developed a patented electrode manufacturing process wherein they deposit a thin film of Ti upon a doped Si substrate. This is then covered with a film of Ag and finally another layer of Cu. The resulting 'sandwich' is then parted between the Ag and Ti layers. This creates two electrodes with matching topogrophies. While they are not flat, the vacuum gap remains suitable uniform in width due to the conforming topogrophies of the two electrodes. They then use piezoelectric actuators to keep regulate the width of the vacuum gap. This method allows for the creation of devices large enough for practical applications. Furthermore, because the Silicon and Copper layers can be of relatively low purity and the Titanium and Silver layers are only several atoms thick, these promise to be manufactured without high overheads from materials costs. Power Chips PLC's research is now focused on scaling the device and on achieving high tunneling currents suitable for power generation. They are currently seeking industrial partners to help underwrite this final research step. As mentioned before, these Power Chips operate at very high Carnot Efficiencies (70-80%) and thus offer great potential for power generation. Power Chips could theoretically operate from 100-5000 Watts/cm but realistic estimates are more like 10-40 W/cm. Power Chips PLC estimates that production costs will be below $1.00/Watt which would make them quite competitive. The chips could initially be deployed to make effective use of waste heat from a variety of sources, from traditional power generation to industrial applications to waste heat from automobile exhaust. Think of a combustion chamber lined with Power Chips generating power from the waste heat after the initial energy is used to generate mechanical work (i.e. spinning turbines, moving pistons etc.). Eventually, Power Chips could replace conventional power generation and internal combustion engines entirely. They could even be combined with solar-thermal concentrators for an efficient and renewable power source. Obviously these devices hold amazing potential but again, are in the early pre-commercialization stages. They seem to have a few tasks ahead of them, these being: 1) develop sufficiently high current for power generation uses; 2) scale the devices to a suitable size (manufacturing 1 square-cm chips isn't going to go to far); and 3) developing a scalable, efficient, and hopefully assembly-line style production method. While this may be a long way off, it is still exciting to read about what potentially revolutionary breakthroughs are out there on the horizon; today's two were brought to you by the wonders of nanotechnology. Well that's just pefect perfect timing. It seems that the Power Chips PLC website has gone down. I'm not sure what this portents but hopefully it is just a temporary thing. Sorry about that (most of the links in the post are from their site so they will be broken). I have also come across some speculation in forums that this company is bogus, that they could never produce this technology on a mass-production scale. This may prove to be true but I think, for now, there is hardly enough information to make that conclusion and that this is merely the opinion of naysayers at this point. Power Chips PLC do make some amazing claims, but that alone doesn't mean their technology is bogus. I'm not sure why both Power Chips and Cool Chips' sites are down. Maybe they are simply retrofitting the site or their servers or are experiencing technical problems. Another possibility is that they have secured a governmental contract and no longer want to publicize their product as openly. They have already kept largely on the down-low in the past so this wouldn't be surprising. And, now it seems they are back. Their links work again - they seem to have gotten back online while I was writing the previous comment. Again, what timing!